Elizabeth was born on Aug. 1, 1782 to parents William Gould Dake and Margaret Mosher Dake in White Creek, Washington Co., N.Y. She married a Mr. Fuller. They had a daughter Ann (she married David Earl). They also had a daughter Margaret who married Orin Ostore. (Margaret lived in Albion, Orleans Co., N.Y. Elizabeth lived in Pembroke, Genesse Co., N.Y. She died in 1886 but the place of her death is unknown. Anna was born on April 30, 1784 to parents William Gould Dake and Margaret Mosher Dake in White Creek, Washington Co., N.Y. She married Rev. Abraham Bentley on Dec. 26, 1875 in Greenfield, Saratoga Co., NY. (He was born in 1783 in Dutchess Co., NY and died Dec. 26, 1875 in Greenfield, Saratoga Co., NY). She died in Daketown, Saratoga Co., N.Y. on 30 June 1851 and is buried in the Dake Cemetery. Her husband in also buried in the Dake Cemetery. They had children: Angeline (b. 1811), Ambrose (b. june 22, 1814), Eunice (b. Mar. 28, 1822), Amanda and Amy. Charles was born on Feb. 28, 1786 to parents William Gould Dake and Margaret Mosher Dake in Cambridge, (Albany) Washington Co., N.Y. He married Lorinda Lewis at Greenfield, N.Y. on Mar. 24, 1831. He later married a Sally (Sarah) Handford in Greenfield, N.Y. (She was born on Jan. 17, 1788 at New Canaan, Conn. and died on Dec. 13, 1843 and is buried in Nunda, Livingston Co., N.Y.). He was a Abolitionist and is listed in the US Congressional Record on Jan. 21, 1839 as a petition signer "praying for the abolition of slavery in the District of Columbia and in the Territories of the United States, and of the slave trade in the States." He also signed a petition "against the admission of any new State into this Union, whose constitution tolerates slavery, and against the admission of Tesas into the Union." He was a medical doctor. He then married Mary Gillette in 1869 in Penn Yan, N.Y. He died sometime before 1869 at Penn Yan, N.Y. and was buried at Oakwood, Nunda, N.Y.
Orsamus G. was born to Charles Dake and Sarah Hanford on Sept. 22, 1806 at Greenfield, Saratoga Co., N.Y. He married Mary Utter about 1831. He died on May 29, 1833 and was buried at Mepinger Hollow, Livingston Co., N.Y.
Orsamus Charles was born to Orsamus Gould Dake and Mary Utter on Jan. 19, 1832 at Portage, Livingston Co., N.Y. In 1843 he attended the Nunda Institute in Nunda, N.Y. and was listed as living in Penn Yan, N.Y. He graduated from Madison University, Hamilton, N.Y. in 1849. He then moved to St. Louis to live with his aunt. He took over the editorship of a local paper, The Edwardsville Advertiser. He was also a professor and Lawyer in Edwardsville. Among those he employed was a very good printer and lawyer (Mr. Sparks) who eventually left, to work for another paper in Lincoln, Ill. The twelve men who established The Lincoln Herald were casting about for an abolitionist who would write good editorials in favor of Mr. Lincoln's candidacy. It was Mr. Sparks who told his partners, "Young Dake's your man, he's wasted on the Advertiser." He accepted the position and moved with his wife and three little children to Lincoln, Ill. During Lincoln's campaign, the town of Mt. Pulaski was having a political gathering. Mr. Lincoln gave the talk on law and politics and Orsamus spoke for the press. Mr. Lincoln and Orsamus drove the twelve miles together. In 1860, a Samuel Parks who owned or was the Editor for the Lincoln Herald, wrote a letter to Abraham Lincoln appologizing for an article that Orsamus wrote about his son Judd Lincoln. He wrote "What could have induced Dake to wite it I can't conceive. I belive I have told you that Dake, though a good writer takes ballast sometimes makes a fool of himself ". He followed in turn the vocations of teacher, county superintendent of schools, editor of a political paper in Illinois, Clerk of the Interior Dept. at Washington, D.C., Clergyman and Professor of Belle Letters in the State University of Nebraska. He married Amanda Catherine Eaton on Feb. 9, 1853 at Edwardsville, Ill. (She was born on Sept. 24, 1836 and died on Dec. 24, 1927. She was the daughter of Judge H. K. Eaton of Edwardsville, Ill.) He was ordained June 1862 as a Minister of the Episcopal Church, arriving in Nebraska a year later, where he founded Brownell Hall in Omaha. On Trinity Sunday 1863, Orasmus C. Dake was ordained and elected Rector of Trinity Church. The Rev. Mr. Dake was to receive $700 a year, half to be paid by Trinity and half to come from the Committee on Domestic Missions in New York. Bishop Talbot requested that he give a Sunday each month to Holy Trinity Church, Bellevue, which was at that time boasting a congregation nearly as prosperous that in Omaha. In September 1863 Bishop Talbot opened Brownell Hall The school was for young ladies and it still remains, though now a coeducational school. (Now Brownell Talbot College Preparatory School) and Fr. Dake took on the additional duties of becoming rector and principal of Brownell Hall. Trinity Church took an active interest in Brownell Hall by sending out solicitors for it and aiding in the establishment of scholarships, but the double duty of Fr. Dake became irksome. At a meeting of the vestry held November 6, 1863, a committee was appointed to inform Bishop Talbot that "under the present arrangements, the residence of our minister being out of the city and being principal of Brownell Hall, our church is in languishing condition, and to ask him to aid us in our emergency. Fr. Dake promptly offered his resignation to take effect upon the arrival and installation of his successor. It was immediately accepted by the vestry. Bishop Talbot asked the Vestry to reconsider, but Fr. Dake refused the offer. The vestry then decided to become a self-sustaining parish church. They advised Bishop Talbot that they wanted no more aid from the Board of Missions, and that they would make a call for a minister independent of him. Thus the mission period of Trinity church ended. In 1865 he founded a church (St. James and built a house of worship) in Fremont, NE.. His first book, "Nebraska Legends and other Poems" was published in 1871. One of the key poems in the collection is "Weeping Water," based on a battle between the Omaha and Otoe tribes, a battle so fierce that the widows and children of both tribes were said to have wept over the dead, their tears forming the stream known as Nehawka or Weeping Water. He later published "Midland Poems". Especially loved by his wife was the poem "Groping", a reminder of their courtship days in Illinois. In Nebraskans (1972), AC Edmunds describes Dake as "of small stature but of a compact and perfect build; possessed of strong mental and muscular developments. His whole soul is wrapped in the love of literature, and his religious training and experience give caste to all his Productions." He would later be appointed as the first teacher of literature at Nebraska State University, among a total faculty of five, each drawn from a different religious denomination. Contributed by Dale Dake: Orsamus was a professor and a lawyer in Edwardsville, Ill. Lawyer Sparks ask Orsamus to come to Lincoln, Illinois and edit the Lincoln Herald. Abraham Lincoln was practicing law in this town at the same time. Anna said he helped Lincoln with his presidential campaign. Lawyer Sparks later became congressman for Colorado. Orsamus went to Washington, D.C. and worked for the Illinois congressman during Lincoln's presidency. In 1862, Orsamus traveled to Omaha, Nebraska where he established an all girl Episcopal school called Brownell Hall. Later in the year Amanda and her family followed, making the trip from St. Louis to Omaha by river boat. Orsamus was professor and Amanda taught primary at Brownelle. They lived in Omaha 3 years, then they moved their family to Fremont, Nebraska. Orsamus built the first church (Episcopal) in Fremont. They lived in Fremont six years. During that time he was rector of the church there and he would commute to and from Fontanelle, Nebraska where he was also rector. Some of his records are still in the Fremont church. In June of 1871, Bishop Clarkson called professor Dake to Lincoln, Nebraska to be a professor of English Literature and Modern Languages. He taught English and French. [This made Orsamus Charles one of the first professors at the University of Nebraska.] He was a professor there till he passed away on October 18, 1875. He died three months before his forty-fourth birthday and he didn't live to see their seventh child born. William Eaton [their 3rd child] was getting an apple from an apple bin when he backed into a boiler full of hot water. He scald himself so severely that he died. Now this happened in 1862, he was only four years old. I don't know if it happened in Edwardsville or Omaha. On July 4, 1866, Orsamus and Orsamus's Aunt Kline, Amanda and Amanda's sister, Litta Eaton and Orsamus and Amanda's three children, Charles, Mary, and Sarah, decided to spend the day picnicing with their friends, the Ray family. John Ray and wife had four children and a tiny 2 week old baby. near Fontanelle. In order to get there they had to cross the Elkhorn River. The river flow was normal when they crossed on their way to the picnic area. During the day however the river rose and on their way home that night they had to go back across the Elkhorn on a ferry boat. They drove onto the ferry and started to cross the river. Then the horses became frightened and began to back up until the back wheels dropped off of the back edge of the ferry The frame slid off of the wagon box spilling all the women and children into the river except for Charles. He was on the wagon box floor.Orsamus and John were able to stay with the wagon some how. John saved his wife and their baby. She caught her heel in between the spokes in a wheel. This kept her from falling in the river. She was able to hold on to her baby till John could help them back in the wagon rescuing their baby. Orsamus directed Charles Henry to go for help. He swam ashore and as soon as possible brought men to help that had been celebrating uptown. Orsamus's wife Amanda was wearing a hoop skirt. It was made of material which filled with air and acted as a life preserver. She floated to an island and safety. The other women held onto the wooden frame and was able to save of the Ray children. Her name was Fanny. Three of the Ray children drowned and two of the Dake's three children drowned. Mary was ten years old, Sarah was six. They were both declared drowned as were the 3 Ray children. The two oldest children, Mary and the oldest Ray were never found. Mary's mother, Amanda was never entirely free from the fear that her little girl had been found alive and had been kidnapped by the Indians. There was an Indian camp on the river bank and Indians were around at the time of the accident. Most believe they were buried in quicksand however. This history came from four very sketchy accounts handed down by Orsamus and Amanda's daughter, Anna Margaret and Anna Dake Nuebel, who's father was Charles Henry Dake. Neither of these ladies were alive yet to give us their first hand account of the accident, but both acquired first hand accounts from their parents, and wisely wrote them down. Each account varies slightly, even the dates, but they are basically the same. George Thomas Dake was born April 28, 1867 in Fremont. His life was short lived. He died when he was only two weeks old. This had to be an extremely tragic event for Amanda and Orsamus happening so soon after the deaths of Mary and Sarah. Orsamus and Amanda had one more child in Nebraska. Anna Margaret was born 8-22-1868. Charles and Margaret were the only children living when Orsamus died." He died on Oct. 18, 1875 at in Lincoln, Nebr. He suffered apoplectic stroke. Amanda was in a family way when Orsamus passed away. She lost no time in moving her family back to her old home town, Edwardsville, IL. She passed away in December, 1929. She is buried in Edwardsville, Illinois. Charles was born to Orsamus Charles Dake and Amanda C. Eaton on Dec. 28, 1853 at Madison, Ill. His family had move to Fremont, Nebraska in 1865, where his father founded a church. (Family history told by Dale Dake and contributed by Jana Karika): "Charles Henry Dake was twenty-one years old when the family returned to Edwardsville, IL. He dreamed of returning to Nebraska and farming on the new farm land. Now the Buchta family lived at Edwardsville also. they too had dreams of moving west to Nebraska also. John and Savilla Buchta had five sons and two daughters. The sons were John, Walter, Adam, George and Will. the daughters were Caroline and Emily. Now Charles Henry couldn't seem to take his eyes off of Caroline whom he called Carrie. So on Oct. 8, 1878 Charles married the lovely Carrie Buchta. Shortly after their marriage they moved to Washington County, Nebraska to live on his aunt Klines land. While they were there William Dake was born on January 14, 1880. Some time later Charles and John Buchta teamed up and homested land nine miles north of Osceola in Polk County, Nebr. Chester John Dake was born on Aug. 11, 1884. His mother went to Edwardsville to have him, then they came back and lived on the homested. He was named after President Chester A. Arthur and his uncle John Buchta. Caroline Buchta (She was born on Aug. 17, 1858 at Edwardsville, Ill).Caroline died on April 22, 1894, at Silver Creek, NE. I heared she died during twin childbirth. The babies didn't make it either. On October 18, 1896, Charles Henry married again to a young widow lady named Bertha May Butterfield Morgan at Osceola, NE. [After her first husband died], Bertha moved back to Shelby Nebr with her son. She set up and operate a milinary business there. She run the business until she married Charles [Henry] Dake in 1896. Bertha and Charles had 5 children between them when they got married. They lived on the Buchta, Dake homestead. They had developed it into a very productive general purpose farm. The farm was 160 acres of Platte River bottomland. They raised every kind of field crop, plus hap or cattle. They had many fruit trees they cared for and they raised and cared for a large garden. Then there was 20 cows to mlk and 500 young chickens plus laying hens to take care of.Enough work to keep a family of seven busy and to support them alll. Soon however, their family began to grow in number and Carrie's children were growing up. Anna Lenore Dake was born June 26, 1898; May Bertha Dake was born Feb. 9, 1901; Ruth Margaret Dake was born July 19, 1902. By this time William (Will) Dake was 22 years old and Chester (Check) Dake was 18. They were beginning to do things on their own. Will atend college and was teaching school. Check was establishing himself in the farming business. Things were pretty tight for Charles and Bertha but they made it alright till 1908. [When Merle, Bertha's 19 year old son from her first marriage, died of pneumonia.] About the same time, DeAlton Benson became the agent for promoting Colorado land for homesteading. He and Charles Henry, sons Will Dake and Chester Dake, along with neighbors Ole Olson, Elmer Lyons, and Mr. Finecy all of Silmer creek, Nebraska filed claims. In the spring of 1908, Mr. Finecy, a carpenter and Charles Dake and others went to Colorado to get some buildings on the land. They took Hetta (Henrietta) along to cook. She also wanted to file on a half section just south of her father's, which she did later. Bertha and Melitta and a hired man were left to cope with the farm. They were milking 20 cows and tending 500 chickens besides all the fruit and vegetables that had to be canned. Bertha did not want to go to Colorado. She had lived on a dry farm in Oklahoma. She didn't like it. She liked their lush valley farm even if it was small. [Bertha soon after went into a diabetic coma and died in July of 1909.] In April 1910, the Olsons, Lyons, Fenecys, and Charles Henry moved their families by emigrant train to Weld County, Colorado. Charles, Will, Check and Hetta each homestead 320 acres there. Charles Henry Dake died on May 11, 1920 at Silver Creek, Nebr. Charles Henry Dake and his first wife Caroline are buried in an old abandon church cemetery north of Osceola. Very close to the farm they lived on before Charles moved to Colorado to live. The valley land stayed in the family until it was sold during the 1930 depression for pennies on the dollar. " William was born on Jan. 14, 1880 at Silver Creek, Nebr. to parents Charles Henry Dake and Carolina Buchta. He married Charlotte Heinemeyer. He attended college and taught school. On July 5, 1968 he died at Silver Creek, Nebr. Chester and Ethel said the first winter storm was so bad on the homestead they brought their horses into their new house to keep them from freezing to death. They only thing that was plentiful were antelope. Ethel said they came close enough to the house that they could shoot them with a 22 rifle. Ethel and Chester did not like it in Colorado. As soon as they proved up on the land and acquired their deed they moved back to Surprise, Nebr. There was never a truer pioneer then your grandmother Ethel. She was born on a homestead in 1889. She traveled east in a covered wagon in 1889. The first two cylinder gasoline engine was invented in 1889. Orville and Wilber Wright made their first successful heavier than air flight in the Kitty Hawk in 1903. Henry Ford built his first automobile in 1903. Ethel and Chester's first car was a 1917 model T Ford. Phonographs were all the rage in the 1920s. Radios became popular in the 1930s. Ethel and Chester advanced from horses to a John Deere tractor in 1937. Ethel's life extended from the pioneer days through the first space flights and all the marvels and tragedies in between. She lived through two world wars and ten years of devastating drought and depression. I believe that makes her a bonafied historical pioneer. She was a great cook, too. They lived on and farmed the Judd place, 2 miles north of Surprise, Nebr. after they proved up on their homestead in about 1912 or 1913. It was there that Paul William Dake was born on January 27, 1917. Dale Dean Dake [the writer of this narrative] was born on the Judd farm also, on October 22, 1921. James Earl and Paul went to school in Surprise till the Dake family moved on the Roy Horst farm north of Osceola in the Platte Valley in the spring of 1924. The Horst farm is just a few miles from the farm Chester grew up on. It was quite productive and they were doing well there at the time. Chester and Ethel were anxious however to purchase a nice place of their own where they could raise and educate their children. Chester searched and found a farm that he and Ether both like in Hamalton County 12 miles east of Grand Island. It is only a mile and one half from the small village of Phillips. The farm had a fine set of buildings on it and the yard was covered with many large shade trees. Ethel loved the nice house and beautiful yard. They purchased the farm and moved onto it in the spring of 1927. Except for a bad hail storm in 1928 or 29, things were really great for the whole family. Ethel liked her nice house and yard. She had a nice garden space which we all worked in and enjoyed. Chester was a very good farmer. In those days he raised everything on his farm. All the field work was done with horses. They owned 160 acres and Chester rented another 20 acres. That was a lot to farm with eight head of horses even with sons home to help him. He raised and fed a lot of hogs and chickens. His field crops were wheat, corn, oats, Barley, milo and alfalfa. There was a good reason for the large crop variety. The general purpose farm at that time in history was totally at the mercy of the elements and environment. By raising a variety of crops, the hail storms, hot winds, and grasshoppers couldn't get them all. At least that was the theory. Every thing sailed along smoothly till the stock market crashed in 1929 and many banks failed. Every thing from that point in time on for the next ten years was all down hill for Chester and Ethel. They weren't alone however. People all over the United States were hurting financially. Especially the farmers in the west. Chester and Ethel had a difficult time holding things together in the 30s. When they bought their farm in 1927, they went in debt and when the depression began in 1930 they still owed twenty two thousand dollars on it. To make matters worse they were unable to raise cash crops of feed because of the terrible hot dry winds and hail that frequented that area. This went on for ten years. Every thing suffered. The orchard died, all the nice trees around the buildings died. The only trees that survived were some Juniper trees. By 1940 when the drought and depression was over, Chester and Ethel had lost their farm and their land in Colorado. They hung on to the farm near Phillips until 1938 at which time a doctor that held his mortgage foreclosed. By that time the buildings were also badly in need of repair. Really the only thing good that came out of the 30s was their boys education. The Phillips school was very good. All 3 boys graduated there. Chester and Ethel stayed right on the farm at Phillips and rented for ten years. They were able to get back on their feet financially during and after the war. In 1948 they bought the same farm. This time they only bought 120 acres and in 1955 when James came to Phillips and took over the farming they drilled an irrigation well. From that time on, the farm produced real good. Chester only lived six years after they put down the well but he lived long enough to enjoy the wonderful crops they raised every year. Chester passed away on August 6, 1961. Ethel passed on May 23, 1966. James was born to parents John Chester Dake and Ethel (Parsley) Dake on Sept. 9, 1911 at Surprise, NE. (From Dale Dake): "He was in the eighth grade when he stated to school at Phillips. We all road the bus to and from school. James graduated in May 1931. It would take him to tell how tough times were then. There was no money for college and steady work was not to be had. James worked at anything he could find till the late 1930s. He took a sheet metal course at that time and went to work for the Marton aircraft company in a defense plant in Baltimore, Maryland. It was while he was in Baltimore that he married the lovely Clyta Laughlin in 1941. They lived in Baltimore till Marton built a plant in Omaha, Nebr. Soon after, they moved to Omaha in 1942. James was turned down by the draft board in 1942 because he had a heart murmur. " He was a retired machinist and a former resident of Wichita, Kan. He married Lillian (Maiden Name Unknown). He later moved back to Phillips, NE to take over the family farm. He died Tuesday, April 17, 2001, in Citizens Memorial Hospital, Bolivar, MO.. Survivors include his wife, Lillian, of the home; and a daughter Marvis Lary, Wichita, Kan.
Terrance Dake was born on July 22, 1944 in Omaha, Nebraska to parents James Earl Dake and Clyta (Laughlin) Dake. He was raised in the Missouri Ozarks. He earned undergraduate degrees from the College of the Ozarks and the University of Arkansas. He holds a Master of Arts degree from Pepperdine University. He was commissioned a second lieutenant upon graduation from Officer Candidate School, Quantico, Virginia in October 1966. General Dake was designated a Naval Aviator at Pensacola, Florida, on the January 25, 1968. He married Sue Long. Dake logged more than 6,000 flight hours in military aircraft. Significant flying tours include a combat tour in Vietnam in 1968-69 flying CH-53A helicopters; Commanding Officer of Marine Helicopter Squadron One, designated as the President's helicopter pilot, 1983-1985; Commanding General of the 3rd Marine Aircraft Wing, July 1995 - July 1996. General Dake has flown helicopters in every aircraft wing in the Marine Corps. Additionally, he served as the Assistant Chief of Staff of Operations, G-3 for the 3rd Marine Aircraft Wing in Desert Shield and Desert Storm, the largest aircraft wing ever fielded in combat by the Marine Corps. Dake served as the Director of Joint Training and Doctrine with the Commander-in-Chief of the United States Atlantic Command from July 1987 - July 1990. 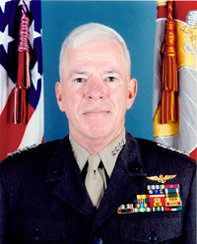 Promoted to brigadier general in March 1992, Dake's assignments as a general officer were: Assistant Deputy Chief of Staff of Aviation; Inspector General of the Marine Corps; Deputy Commanding General, Marine Corps Combat Development Command; Commanding General, 3rd Marine Aircraft Wing and Deputy Chief of Staff for Aviation. Dake was advanced to the rank of General and assumed his position as the Assistant Commandant of the Marine Corps on September 5, 1998. He retired from the Marine Corps on September 7, 2000. Jana was born in 1970 to parents Terrence R. Dake and Sue (Long) Dake. . She married Ken Karika. Joshua was born in 1975 to parents Terrence R. Dake and Sue (Long) Dake. Joshua married Kelley Smagatcz. Zachary was born in 2006 to parents Joshua Wade Dake and Kelley (Smagatcz) Dake. Samuel was born in 2008 to parents Joshua Wade Dake and Kelley (Smagatcz) Dake. Mavis was born to parents James Earl Dake and Lillian (maiden name unknown) Dake. Paul was born on January 27, 1917 to parents John Chester Dake and Ethel (Parsley) Dake at Surprise, NE. He atended school in Surprise until the family moved to Osceola, NE in 1924. In 1927 they moved again to Phillips, NE. Paul was drafted into the Army Air Force as a maintenance man durng WWII. Dale was born on October 22, 1921 to parents John Chester Dake and Ethel (Parsley) Dake at Surprise, NE. He atended school in Surprise until the family moved to Osceola, NE in 1924. In 1927 they moved again to Phillips, NE. Dale was drafted into the Navy as a maintenance man during WWII. Henrietta was born on June 3, 1889 at Silver Creek, Nebr. to parents Charles Henry Dake and Carolina Buchta. She married Edward Cassidy. The date of her death is unknown. Melitta was born on Nov. 9, 1891 at Silver Creek, Nebr. to parents Charles Henry Dake and Carolina Buchta. She married Alfred Grossnicklaus on Aug. 17, 1909 at Osceola, Nebr. The date of her death is unkown. Anna was born on June 26, 1898 at Silver Creek, Nebr. to parents Charles Henry Dake and Bertha Morgan. She married William Jacob Nuebel. Mae was born on Feb. 9, 1901 at Silver Creek, Nebr. to parents Charles Henry Dake and Bertha Morgan. She married Paul Wisely. Ruth was born on July 19, 1902 at Silver Creek, Nebr. to parents Charles Henry Dake and Bertha Morgan. She married a Mr. Martin and a second time to a Mr. Thompson. Anna was born to Orsamus Charles Dake and Amanda C. Eaton on Aug. 22, 1868 at Fremont, Nebr. She married Sept. 1897 to Cyrus Love at Edwardsville, Ill. She died on Aug. 1, 1951 at Edwardsville, Ill. She had children: Amanda Catherine (born Aug. 29, 1898 IL, married Roy Emerson Horst, died Mar. 30 1989, San Bernardino Co., CA), William Cyrus, Anna Carlotta, Margaret Beatrice and Mary Dake. Orsamus was born to Orsamus Charles Dake and Amanda C. Eaton on Jan. 18, 1876 at Edwardsville, IL. He was married to Jennie Lenore Faires, at St. Jacob, Ill. in 1898. He died on Sept. 15, 1931 and was buried at College Hill Cemetery, Lebanon, St. Clair Co., IL. Donald was born to Orsamus Clarkson Dake and Jennie (Faires) Dake on Mar. 12, 1899 at St. Jacob, Ill. He married Mary Jacobsen. He died on Feb. 1960 and was buried at College Hill Cemetery, Lebanon, St. Clair Co., IL. . He had no children. George was born April 28, 1867 at Fremont, NE to Orsamus Charles Dake, Jr. and Amanda C. (Eaton) Dake but died when he was only 2 weeks old in May 1867. William was born October 11, 1858 in Edwardsville, IL to Orsamus Charles Dake and Amanda C. (Eaton) Dake. In 1862, when he was only four years old while trying to get an apple from an apple bin, he backed into a boiler full of hot water. He scalded himself so severely that he died. (Not sure if this was in Edwardsville, IL or Omaha, NE). .
Sarah was born on October 11, 1861 in Edwardsville, IL to Orsamus Charles Dake and Amanda C. (Eaton) Dake. She drowned on July 4, 1866 in the Elkhorn River when horses backed their vehicle off a ferry boat. Mary was born on Jan. 8, 1857 in Edwardsville, IL to Orsamus Charles Dake and Amanda C. (Eaton) Dake. She drowned in the Elkhorn River when horses backed their vehicle off a ferry boat. Jabez was born on April 22, 1788 to parents William Gould Dake and Margaret Mosher Dake in Daketown, Saratoga Co., NY. He was married to Sophia Bowen on March 5, 1809. (She was born in Smithfield, RI on Oct. 10, 1793. She died on March 30, 1850 at Nunda, NY). He fought in the War of 1812. Prior to 1830 he practiced medicine at Johnstown, NY. Jabez was one of the first medical doctors in this area. For many years after settling in Genessee County, NY he practiced medicine by riding about the country on horseback. He died on May 11, 1846 in Nunda, Livingston Co., NY. Abigail was born on April 22, 1790 to parents William Gould Dake and Margaret Mosher Dake in Daketown, Saratoga Co., N.Y. She married a Daniel Northrop of Galway, N.Y. on Dec. 18, 1811 by Justice Charles Deake, Jr. She died in 1869. AHAF. William Gould Dake Jr.
William Jr. was born on July 25, 1792 to parents William Gould Dake and Margaret Mosher Dake in Daketown, Saratoga Co., N.Y. On Dec. 20, 1815 he was married by his uncle Charles Dake Jr., Justice of Greenfield, N.Y., to Orpha Miller of Gallaway, N.Y. (She was born on Oct. 30, 1790 at New Harford, MA to parents Jonathan Allen Miller and Hannah (Case) Miller. Her father was a Methodist minister in Galway, Saratoga Co., NY. She died on Feb. 16, 1878 at the home of her son Jabez William Dake). In the Spring of 1820 he with his wife and two small children (Jonathan and Charles) started out with Indians as guides to locate in what was to be a permanent home in the town of Portage known as Oak Hill on the river road and what was then thought to be the wilds of the far west. Willaim and his wife purchased land on July 27, 1822 from John Hornby through his attorney John Greig (100 acres in Lot No. 142. This warranty deed was dated Nov. 19, 1828 and recorded Feb. 10, 1829. 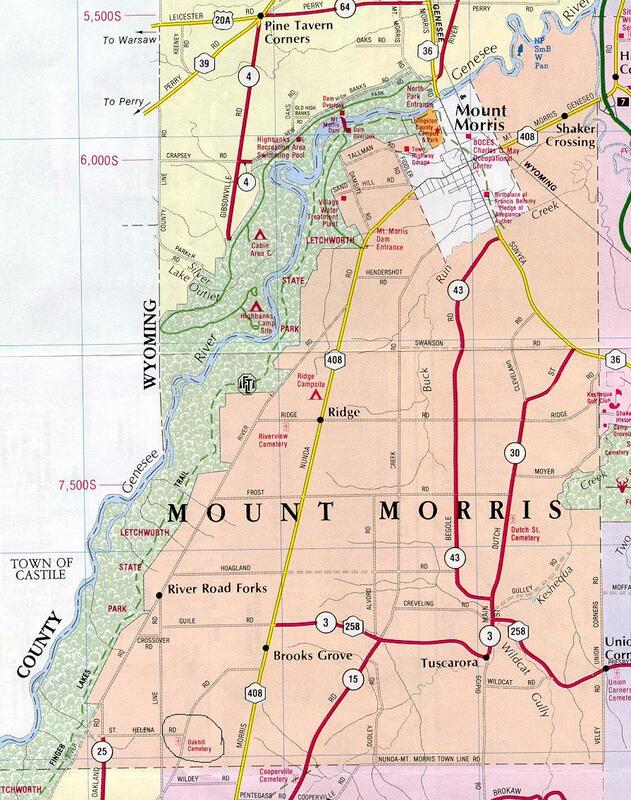 The land was located near of intersection of what now is known as River Road and Oakland Rd. Bounded on the north by the north line, on the east by the Oakland Rd and on the south by what was the Nunda Rod & Gun club). They first built a log home and in 1830 replaced it with a frame home. (In 1886, there was still standing a toppled house that they built in 1830 where the Oakland road joins the River Road. This house stood until 1872). In 1820, Nunda had then but a few log houses and the Indians roamed at will through the forest paths. The brother of his wife who was a Methodist Minister was the only white friend on the way. This brother later organized and was the pastor of the First Methodist Society in Portage, NY.. An ox team being their only means of transportation. They lived in the Oak Hill area for over 50 years moving only once and that was from a log house in the forest into alarge frame house which they occupied together until the death of their only daughter, Mrs. Clara E. (Dake) Dixon. She had lived with and cared for them until September, 1872 when they were compelled, from their feeble condition, to leave the home. He died on May 1, 1873 on the River Road at Oak Hill, Livingston Co., N.Y. and is buried in the Pickett Line Cemetery (now called the Oak Hill Cemetery). Orpha moved in the fall of 1874 to live with her son, Dr. Jabez William Dake in Nunda, NY. Oak Hill Cemetery just east of this location. Eunice was born on Aug. 25, 1794 to parents William Gould Dake and Margaret Mosher Dake in Daketown, Saratoga Co., N.Y. She later was later married to a Samuel Shepherd on July 23, 1814 by Justice Charles Deake, Jr. They had sons William and Benjamin Shepherd. They lived in Pennsylvania. She died in 1822. LINK TO BENJAMIN WILLIAM DAKE SR.
Lucy was born on July 18, 1800 to parents William Gould Dake and Margaret Mosher Dake in Daketown, Saratoga Co., N.Y. She married a Mr. William Weed of Nunda, Alleganey Co., N.Y. Her father William G. was living with her and her family at the time of his death. She died in 1886. John was born on Aug. 20, 1804 to parents William Gould Dake and Margaret Mosher Dake in Daketown, Saratoga Co., N.Y. He was named as one of the executors in the will of William G. Dake. He lived in Portage, Allegheny Co., N.Y. He married Emeline Barrett on Jan. 6, 1839. On May 22, 1851 he purchased land in Caneadea, Allegheny Co., N.Y. from Nicholas Deven. Albert was born about 1841 in Allegheny Co., NY to parents John Enreigh Dake and Emeline (Barrett) Dake. He died on April 27, 1858 at Caneadea, Allegheny Co., NY. Emma was born July 4, 1842 in Allegheny Co., NY to parents John Enreigh Dake and Emeline (Barrett) Dake. She married John Sherry on Jan. 15, 1868.